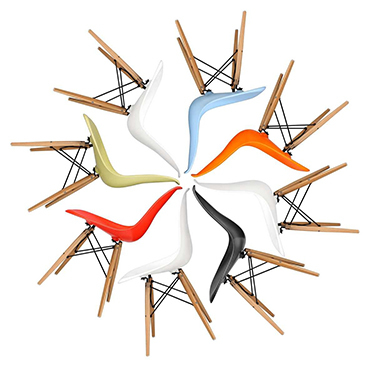 The decorative Charles Eames-inspired House Bird is a must-have addition to the interior of every style-led home. A prized possession of Charles and Ray Eames, the original black bird sculpture stood in the centre of their home for over 50 years. Acquired during their travels through the Appalachian mountain region of the eastern United States, the bird is an artefact of traditional American Folk Art. Birds often symbolised freedom and friendship, and with its tapered beak and sleek tail, this graceful figure certainly has a spirited, friendly presence. This solid wood reproduction is identical to the original, so you can experience the same pleasure the design brought to the Eames' household. The Charles Eames House Bird rose to stardom in the 1950s, when Charles and Ray Eames positioned it with a group of Eames DSR chairs for a publicity poster. It also frequently appeared in photographs taken at the Eames' house. The original black wooden bird is thought to have been created by Charles Perdew in approximately 1910. Perdew was the owner of a gun repair business who started carving birds for decoys. He did the majority of the carving with a drawknife, wood gouge and whittling knife. The House bird will fit comfortably in any Eames-inspired home, alongside the iconic DSW chair, DSR Chair and the Eames Hang it All.